Sail Boat Project is a Workers’ Co-operative aiming to widen access to the sea and working towards zero emission transport for their products. On Wednesday 1 May, from 7pm there will be a chance to try and buy some of them at Brighton Sailing Club. There will be organic olive oils, whole olives, sea salt and a selection of Portuguese wines from the Douro region, all brought to our shores by the power of wind. You can also hear from Sail Boat’s partners Xisto Wines and New Dawn Traders, as well as find out more about the story of this local worker co-op and how it works. Sail cargo in a nutshell: Olives grown grown by the Reigado family in Portugal, found by olive sommeliers Passeite, brokered by New Dawn Traders, shipped to Torbay by Fairtransport via the French Isle of Noirmoutier to collect Fleur de Sel, all loaded aboard Sail Boat’s Jalapeno with amazing Xisto wines and sailed to Brighton and Newhaven for collection onboard or delivery to your door Zedify cycle couriers. Also available with your veg box from Barcombe Nurseries. All surplus from the Sail Cargo work goes to Sail Boat’s Community Sailing Fund, established to help people from community groups in Sussex access their sailing activities. The event takes place on Wednesday 1 May 2019, 7.00-10.00pm at Brighton Sailing Club, 109-111 Kings Road, Brighton, BN1 2FN. There will be some food. Please book your free place here. Running a co-operative, social enterprise or community group and looking for tips on raising your profile or getting more people involved? Join us on Monday 19 November to hear local co-operators share their experiences and what they have learned about social media, getting more members/volunteers and marketing on a budget. Dhara Thompson from the Sail Boat Project, a Brighton based Workers’ Co-operative which provides aims to widen access to the sea, offering sail training to individuals and community groups. They are also involved in sail transport of cargo. Felix Lozano from Wave, a graphic design co-operative, working in both print and digital media. At Mutual Aid In Sussex (MAIS) we like to encourage co-operation and mutual support among co-operatives and community focused organisations. So, after we have heard from the speakers there will be the chance for all of us to share our promotion tips and challenges with each other. There will be time for questions and getting to know each other. Some of us will go to the pub afterwards, please join us! The workshop will be free (donations welcome). Doors will open at 7.00pm, with a 7:30pm start on Tuesday 13 November in the Lagoon Room at the BMECP Centre, 10A Fleet Street, Brighton, BN1 4ZE. The venue is a 5-10 minute walk from Brighton railway station and is wheelchair accessible. We will be on the lower ground floor, accesible by lift or stairs. There are shops nearby where food and drink can be purchased and there will be cold drinks and small snacks available on the night. There is no parking at the BMECP Centre. The London Road NCP multi-storey car park is the best one and cheapest and is a short walk from the BMECP Centre. The car park entrance is in Providence Place (BN1 4GN), which can be reached via Elder Place from London Road and from New England Street via York Hill. The exit is on New England Street. Vantage Point Car Park: Walk south-west on Elder Pl towards New England St, then turn left onto New England St, finally turn right onto Fleet St and you will see the BMECP centre on the left. Nawal Slemiah co-founded the Women In Hebron co-operative in 2005 in the West Bank, Palestine. It began by selling handicrafts in the Old City market of Hebron – an area which is under Israeli military control. Nawal will be speaking in Brighton on Tuesday 23 October to tell the story of the co-operative and what it is like to operate under the Israeli Occupation. The co-operative now has more than 150 women producing items sold across the Hebron district. The co-op is part of the Idna Cooperative Association for Embroidery and Handicrafts which has been able to open a small community centre in Idna, a town in the Hebron district. Here members of the association can gather together to do their work and socialise. Nawal will be bringing some of the goods produced by Women In Hebron and they will be available to buy at the event. The talk will be free (donations welcome) and start at 7.30pm on Tuesday 23 October in the Lagoon Room at the BMECP Centre, 10A Fleet Street, Brighton, BN1 4ZE. Nawal will speak for an hour with space for questions afterwards. There will also be time to find out more about the organisers Mutual Aid In Sussex and local Palestine solidarity campaigns. The venue is a 5-10 minute walk from Brighton railway station and is wheelchair accessible. There are shops nearby where food and drink can be purchased and there will be cold drinks and small snacks available on the night. 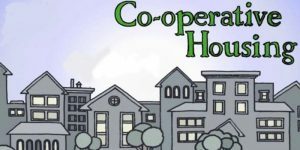 As part of Co-operatives Fortnight 2018 Brighton & Hove Community Land Trust (BHCLT) are organising a tour of local housing co-ops on Saturday 30 June, each with its own story. This is a chance to see some of the ways more genuinely affordable and co-operative housing has been created in the city. The Big Lemon will be driving people between the housing co-ops in a minibus. There will be two tours on the day, one at 9.00am (bus leaves at 9.15am) and one at 12.45pm (bus leaves at 1pm). Each tour is approximately 4 hours long. Tour 1 (morning) will call at Rosa Bridge, Hornbeam, Bug and Two Piers. Tour 2 (afternoon) will call at Rosa Bridge, Dryad, Brighton Rock and Two Piers. More information on all the co-ops, and practical information on the tour and accessibility, can be found here on the BHCLT website. Co-operation among co-operatives is the sixth of seven principles which help co-operatives put their values into practice. They can be followed by any community minded organisation, whether they are formally a co-op or not. Put Principle 6 into action and join us for a meeting and social get together between 6-9pm on Wednesday 6th June in the cafe of the Brighthelm Centre, North Road, Brighton, BN1 1YD. Free food will be provided. The event is FREE but please register via eventbrite so we can keep track of numbers. Co-ops South East have teamed up with Mutual Aid In Sussex (MAIS) to organise this event. There will be a chance to introduce yourself, your project or business and ask for any advice or support you might want from others, as well as see where you can help others out. Anything can be asked for – whether it’s a computer, the number of a good plumber, advice on taxes or anything else. We will also hear briefly about the results of the MAIS/Co-ops South East survey, including what support co-ops and community organisations want as well as initial ideas of future training we will help organise based on the survey. If you haven’t filled in the survey yet, please do so here – it’s just 10 questions. There will also be time for getting to know each other and some of us will be heading to the pub afterwards to carry on the conversations. We are working with Brighton & Hove Community Land Trust (BHCLT) to organise a workshop on how to set up a housing co-operative. Housing co-operatives are one of many ways to create more genuinely affordable and secure housing in the city. There will be time for both a brief introduction to housing co-ops as well as more in-depth advice on how to set them up, based on the experiences of Rosa Bridge. Space will be given for questions and getting to know others. There are limited places available. Please email admin[at]bhclt.org.uk as soon as possible to find out more and sign up. A brief introduction video to what is a housing co-op is below (focused on student housing co-ops, but relevant to all housing co-ops). Housing co-ops don’t have to be for students – there are several which already exist in Brighton & Hove for people of all ages, including Rosa Bridge housing co-op.